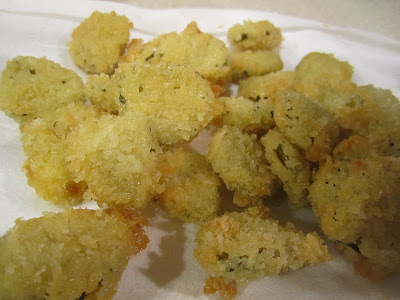 If you are a fried pickle lover, this post might drive you wild. In a good way! In our little family of 2 (two humans, that is), we eat pretty healthy during the week. Dinner cooked at home is traditionally one protein and two veggies. Even though I love them, you'll most likely never find the following on our weeknight dinner table: rice, pasta, corn, rolls, biscuits, roasted potatoes, mashed potatoes, potatoes au gratin, really potatoes of any sort! So the weekends are for letting it all hang loose - within reason, of course. And this Sunday we did just that. Ian made us a double batch of his infamous chili in the slowcooker, and we worked together on making our own fried pickles. 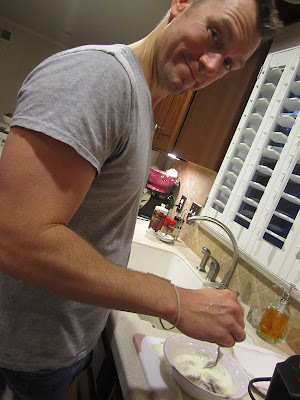 Step 1: Lay pickles out to dry on a paper towel -- this keeps them from getting soggy. Put pickles in a bag of flour and give a good shake. Dip floured pickles into a mixture of 1 cup buttermilk and 1 beaten egg. Then, cover in panko crumbs! 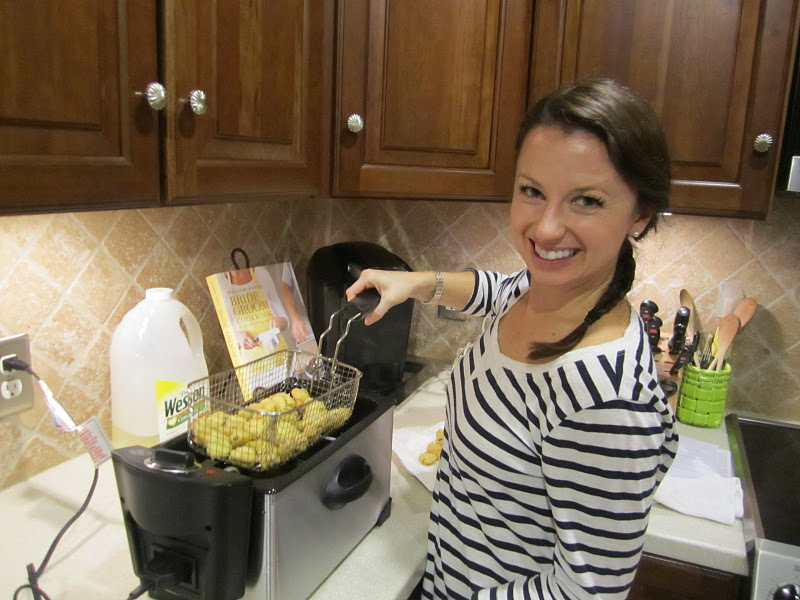 Step 2: Heat the oil in your deep fryer to around 325 degrees. We used canola oil since it is a healthier choice than other oils. My deep frier is from Belk and the brand name is Bella Cucina. My girlfriends gave it to me as a wedding shower gift. I highly recommend it! Step 3: Drop battered and panko-encrusted pickles into the hot oil and watch for them to brown up nicely. Lay on a paper towel when done to omit like 10 calories of the hot oil you've just pumped into them. These are just sinfully good. We ate them with two kinds of sauces -- blue cheese and that chipotle ranch you're probably sick of hearing me talk about. I know, I'm obsessed. 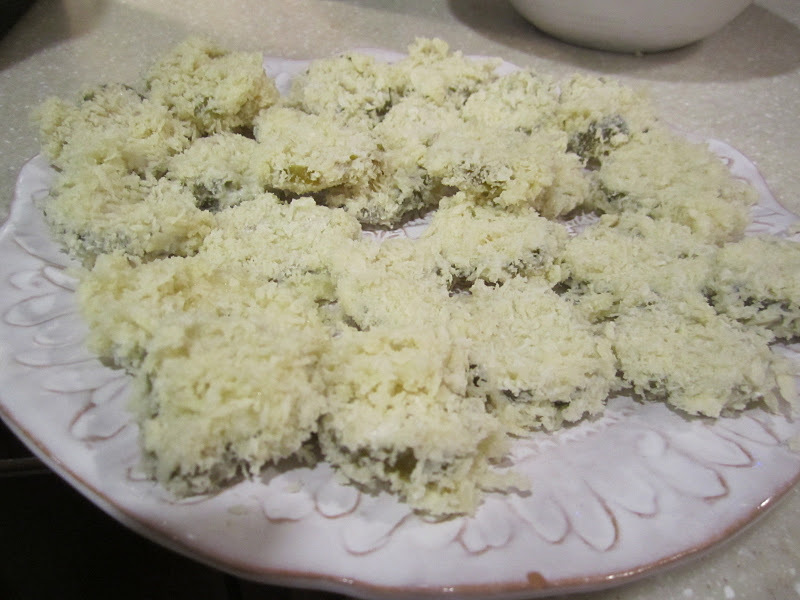 Next time, we are going to use regular bread crumbs rather than panko ... don't get me wrong, I LOVE panko, but it made the crunchy part of these pickles thicker than we are used to. So, what are you waiting for -- get to fryin'! YUM!!! 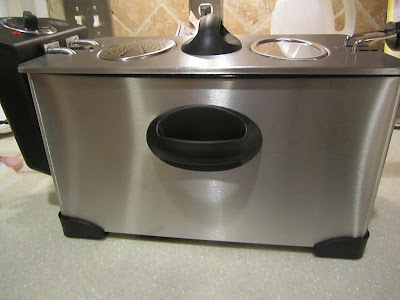 We don't have a deep fryer, but Mr. Smith has been wanting one for a looong time. Fried Pickles might be on our weekend menu too. Thanks for sharing! these look delish! i will definitely have to try! Yummmm I love fried pickles!! Obviously a huge fan of fried pickles. :) Had some at the fair last night and the bf often makes them for me at home as a snack! MMM! I've never had fried pickles, but those sound so yummy. 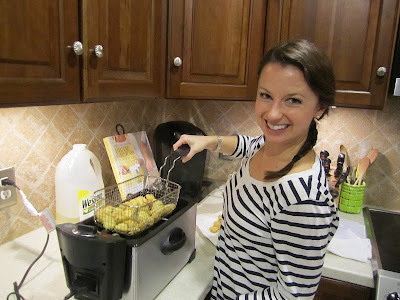 If I had a deep fryer, I'd totally try it! Paula Deen would be so proud! I don't like pickles so this isn't tempting to me, but I have to say, I am impressed with your restraint when it comes to carbs, etc. during the week! Here's the problem: I LOVE fried pickles but I'm too scared to get my own deep frier because I know I'd end up frying EVERYTHING and weighing 9,000 pounds. I don't have the self control. Props to you and hubs for treating yourselves on the weekend and let us know how batch 2 goes! I've never liked pickles until a few weeks ago when Brian introduced them to me. I've probably only had one in my lifetime. But I don't really mind them now. They do look good covered in the breadcrumbs though! I'll have to show Brian and maybe we can try it!! I eat potatoes all the time! They are one of my favorite, probably not the most healthy though!! Usually I'll cook it with chicken or some sort of meat and a veggie. I love pickles and I have never tried fried pickles before. I might have to now after seeing this post! I seriously love fried pickles! That is one thing I really miss about the south! I'm definitely going to have to try this recipe so I can make my own! Yum! Mmm fried pickles! We follow the same meal guidelines as you- healthy during the week and indulging on the weekends!